Well-lit houses and landscapes provide a sense of security and maintenance. The fall creeps ever closer, and the sky is once again beginning to get dark earlier and earlier. Keep the backyard parties coming by incorporating outdoor lights into your landscaping plans – here are 3 reasons why outdoor lighting will improve the look and functionality of your yard. Outdoor light can help make your yard a safer place to work and play. Place lights along walkways to make sure that people can safely navigate your yard. Zone lighting will help to illuminate your patio, deck, or yard for nighttime use. 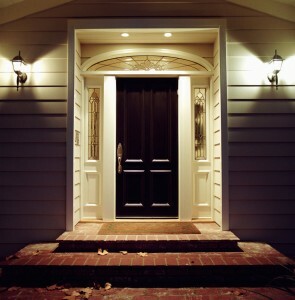 Well-lit sidewalks, driveways, garages, and entryways will help keep people safe as they move throughout your yard. The more lights, the safer your outdoor areas will be. Well-lit houses and landscapes provide a sense of security and maintenance. Lights placed around your home will discourage trespassing and theft. Installing outdoor lights with motion detectors so they turn on when motion activates them can prevent an unfortunate, sneaky surprise. You will feel more secure knowing that you will be able to see danger coming. Fall is your last chance to enjoy that beautiful patio or deck – don’t spend your time stuck inside because of substandard outdoor lights! Comfortable and attractive outdoor lights around your patio or deck will enable you to use these areas after dark. A combination of uplights as well as lights installed on outdoor structures will illuminate your seating areas effectively, and provide great ambiance for enjoying your landscape. This entry was posted on Thursday, September 3rd, 2015	at 1:20 pm	. You can follow any responses to this entry through the RSS 2.0	feed. Both comments and pings are currently closed.